Kerry MacPhee stormed to the Scottish Cycling National Cross Country Championship title in Dumfries and Galloway at the weekend. 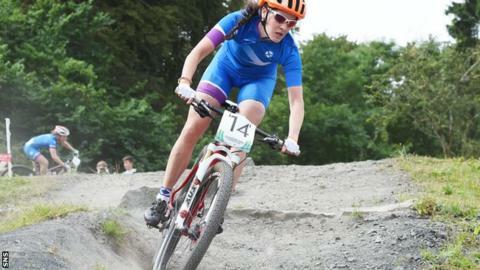 MacPhee rode for Team Scotland in the mountain bike event at the Glasgow 2014 Commonwealth Games, finishing 13th. She led the event in Dalbeattie Forest from start to finish. In the elite men's category Rob Friel took the championship title, after he finished more than nine minutes ahead of his nearest rival. The course for the event was 8km long, featuring a number of challenging aspects, with Team Scotland star Gareth Montgomery having helped tweak it for the championships.